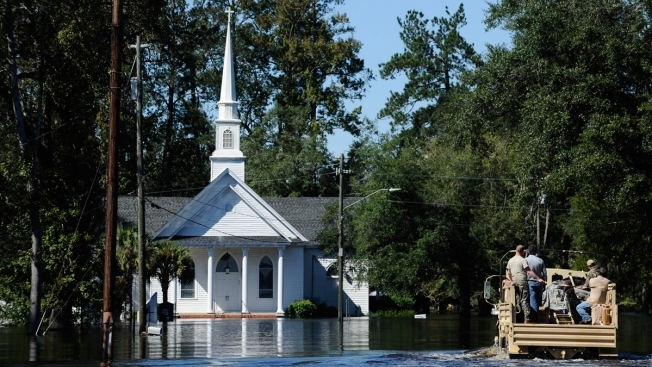 In this Tuesday, Oct. 11, 2016 file photo, Nichols Methodist Church is seen under floodwaters, in Nichols, S.C. Few places in South Carolina are more worried about the possibility of disastrous inland flooding from Hurricane Florence’s heavy rain than the town of Nichols. 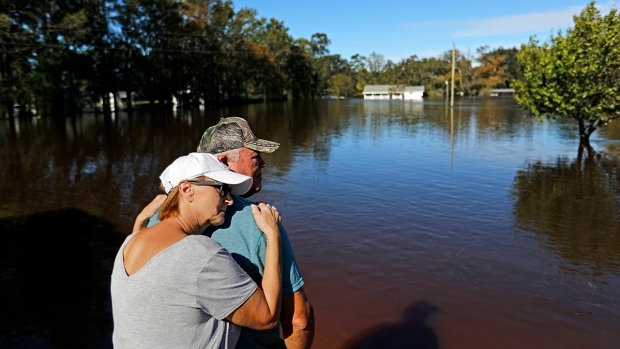 When Hurricane Matthew dumped a foot (30 centimeters) of rain on the area two years ago, the town 40 miles (65 kilometers) inland from the coast lost almost 90 percent of its 261 homes. One woman left town. Another prays her house might somehow be spared again. And one man will just wait and watch and hope the water doesn't rise. Few places in South Carolina are more worried about the possibility of disastrous inland flooding from Hurricane Florence's heavy rain than Nichols. When Hurricane Matthew dumped a foot (30 centimeters) of rain on the area two years ago, the town 40 miles (65 kilometers) in from the coast lost almost 90 percent of its 261 homes. "You've done all this to rebuild and you are better prepared, but here you are again, staring down the barrel," Nichols Mayor Lawson Battle said. 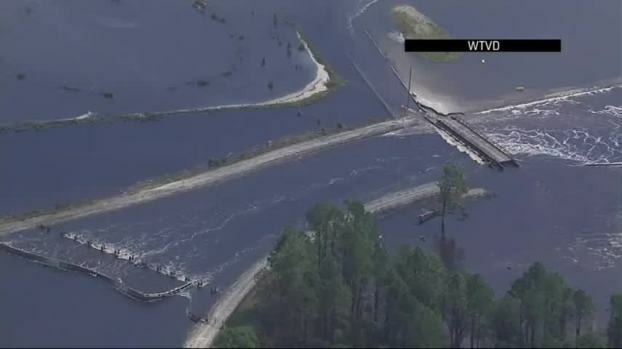 Nichols' problem during Matthew in 2016 wasn't the rain falling on the town so much as the backup of water from the swollen Little Pee Dee and Lumber Rivers, which meet just downstream. One man drowned after he refused to leave his home. Back in 2016, Kathy Finger fell asleep after Matthew's rains ended. She woke up to a strange noise and found water up to her ankles. 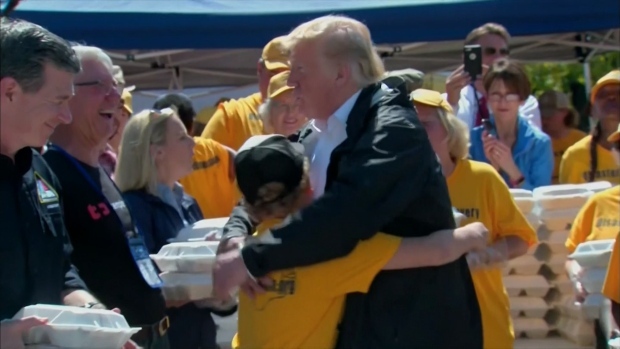 It was up to her knees before a truck rescued her and others and took them to Town Hall, where they eventually found themselves surrounded by water and had to be rescued by boats the next morning. "Nothing has changed from the last time," she said. Thomas Lee noticed the water rising that night two years ago and called his brother-in-law, who came by in a dump truck. They rescued several others before the water got too high for them. Lee's shed still has a grimy, wiggly water line some 4 feet (1.2 meters) above the floor. The town had 22 businesses in 2016. It has 11 now. Main Street is full of boarded-up storefronts, from the old pharmacy to the auto parts store. Lee's home is one of about 150 that were repaired or rebuilt. About 80 homes remain uninhabitable or were torn down, the mayor said. "If it floods like this again, you can just tell Nichols goodbye," Lee said. One of the few houses in Nichols that didn't flood during Matthew was the nearly 100-year-old home Jodi Pajaro inherited from her grandmother. Pajaro was out of town when the flooding started, and water crept toward her house from all sides, stopping just feet away. She had to reach her house by boat and grab what she could five days later. She didn't return permanently for a month. "It kind of makes you wonder — can I be this blessed twice?" Pajaro said as a few raindrops spit from gray skies. Nichols' mayor has spent days on the phone with county and state emergency officials. The flood was a surprise in 2016. If it floods in 2018, rescue crews are ready, and help from all areas will come quickly, Battle said. "Everybody keeps asking me what we need," Battle said of the numerous planning calls. "Right now, I'm taking prayers." Meg Kinnard contributed to this report.